Aptly named, breakfast is the morning meal that ‘breaks’ the ‘fast’ that a person undergoes while asleep at night. The body receives no food for fuel during the night hours and when we wake up in the morning we need a good breakfast to jump start the metabolism and prepare us for the day. A good, balanced breakfast should include whole grains, a dairy product, and some fruit; this healthy mix of carbohydrates, proteins, vitamins and some amount of fats keeps you energetic throughout the day. This book comprises 43 recipes divided into convenient sections. 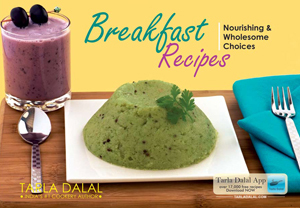 Multigrain Breakfast and Low Calories Breakfast include healthy options like Oats Upma and Moong Dal and Spinach Idli. For a complete breakfast, add a beverage from the Healthy Juice or Refreshing Juice sections. Recipes like Corn Poha and Rice and Cucumber Pancake are Quick and Easy Breakfast choices. If you need to carry breakfast with you, we suggest perfect Tiffin Treats such as Poha Dhokla and Cauliflower Methi Paratha. If you have to grab something on the go, try our energy-dense Breakfast in a Glass suggestions like Almond and Banana Smoothie and Strawberry Honey Milkshake. On holidays do try recipes from Breakfast with a Little Planning section, such as Honey Mustard and Vegetable Sandwich and Oats Rava Idli. With a little effort and planning you can create exciting, nourishing breakfasts that kick start your day in style.